Microsoft 365 Enterprise is a complete, intelligent solution that empowers everyone to be creative and work together securely. Although designed for large organizations, Microsoft 365 Enterprise can also be used for medium-sized and small businesses that need the most advanced security and productivity capabilities. Office 365 Enterprise Includes both Office 365 ProPlus, the latest Office apps for your PC and Mac (such as Word, Excel, PowerPoint, Outlook, and others), and a full suite of online services for email, file storage and collaboration, meetings, and more. Windows 10 Enterprise Addresses the needs of both large and midsize organizations, providing users with the most productive and secure version of Windows and IT professionals with comprehensive deployment, device, and app management. Enterprise Mobility + Security (EMS) Includes Microsoft Intune, which is a cloud-based enterprise mobility management (EMM) service that helps enable your workforce to be productive while keeping your corporate data protected. 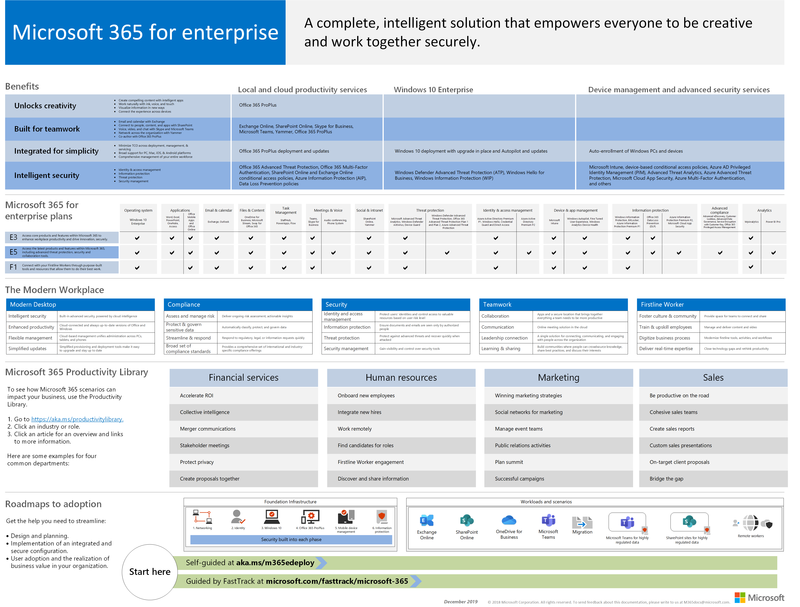 Microsoft 365 Enterprise is available in three plans. E3 Includes Office 365 Enterprise, Windows 10 Enterprise, and Enterprise Mobility + Security (EMS). E5 Includes all of E3's capabilities plus advanced security, voice, and data analysis tools. For more information, see Features and capabilities for each plan. With FastTrack, Microsoft engineers help you move to the cloud at your own pace. See FastTrack for Microsoft 365. The Microsoft 365 Enterprise deployment guide takes you step by step through building out the infrastructure and productivity workloads. Customers use Microsoft 365 Enterprise. Microsoft uses Microsoft 365 Enterprise. The Contoso Corporation, a fictional but representative multinational organization, has deployed Microsoft 365 Enterprise. Bring together the best-in-class productivity and collaboration capabilities of Office 365 with device management and security solutions to safeguard business data for small and midsize businesses (SMB). Get yourself trained and work towards a Microsoft 365 certification. Start with Microsoft 365 Fundamentals. Start your Microsoft 365 Enterprise deployment journey.